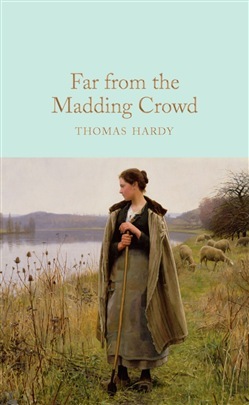 Far From the Madding Crowd was the first of Hardy’s novels to give the name of Wessex to the landscape of south-west England and is set against the backdrop of the unchanging natural cycle of the year. The story both upholds and questions rural values with a startlingly modern sensibility. Part of the Macmillan Collector’s Library; a series of stunning, clothbound, pocket sized classics with gold foiled edges and ribbon markers. These beautiful books make perfect gifts or a treat for any book lover. This edition features original illustrations by Helen Allingham and an introduction by Professor Mark Ford. Gabriel Oak is only one of three suitors for the hand of the beautiful and spirited Bathsheba Everdene. He must compete with the dashing young soldier Sergeant Troy and respectable, middle-aged Farmer Boldwood. And while their fates depend upon the choice Bathsheba makes, she discovers the terrible consequences of an inconstant heart. Acquista Far From the Madding Crowd in Epub: dopo aver letto l’ebook Far From the Madding Crowd di Thomas Hardy ti invitiamo a lasciarci una Recensione qui sotto: sarà utile agli utenti che non abbiano ancora letto questo libro e che vogliano avere delle opinioni altrui. L’opinione su di un libro è molto soggettiva e per questo leggere eventuali recensioni negative non ci dovrà frenare dall’acquisto, anzi dovrà spingerci ad acquistare il libro in fretta per poter dire la nostra ed eventualmente smentire quanto commentato da altri, contribuendo ad arricchire più possibile i commenti e dare sempre più spunti di confronto al pubblico online.